DRAWINGS: FRIDAY, APRIL 26 & SATURDAY, APRIL 27. 5:00pm - 8:00pm; Finale Drawing at 8:30pm. 3 winners every 30 minutes from 5:00pm - 8:00pm each receive $500 in B Rewards! 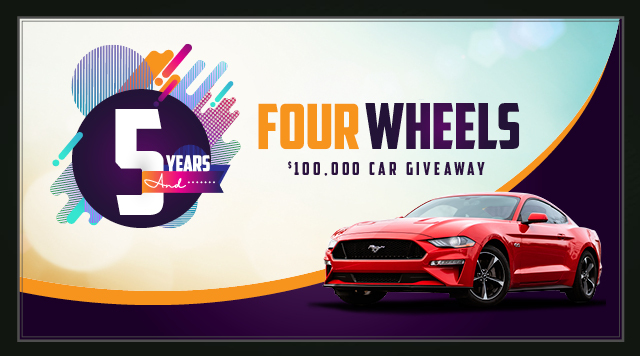 At 8:30pm, two winners will each receive $2,000 in B Rewards and one lucky winner will receive a 700 Horsepower ROUSH Supercharged 2018 Ford Mustang GT! All B Connected members receive oen complimentary entry. An additional entry will be granted for every 10 tier credits earned on a guest's B Connected card during the earning period. Must activate entries between 4:00pm - 8:29pm on the promotional day for drawings. Vehicle provided by Beechmont Ford.